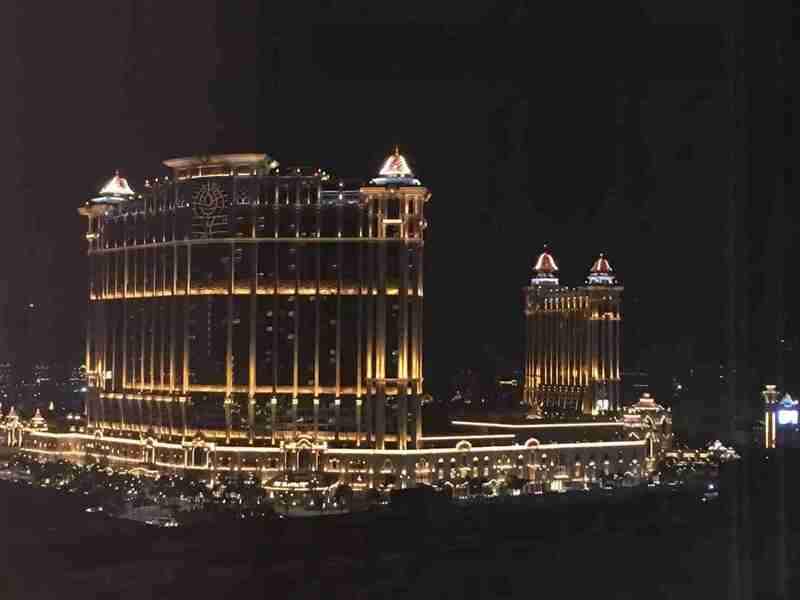 Every time that I’ve traveled to Macau, I have always stayed in Sands Resorts hotels. During the past few years, I have watched the Parisian out my window as it began construction, grew taller and taller, and now finally opened its doors. 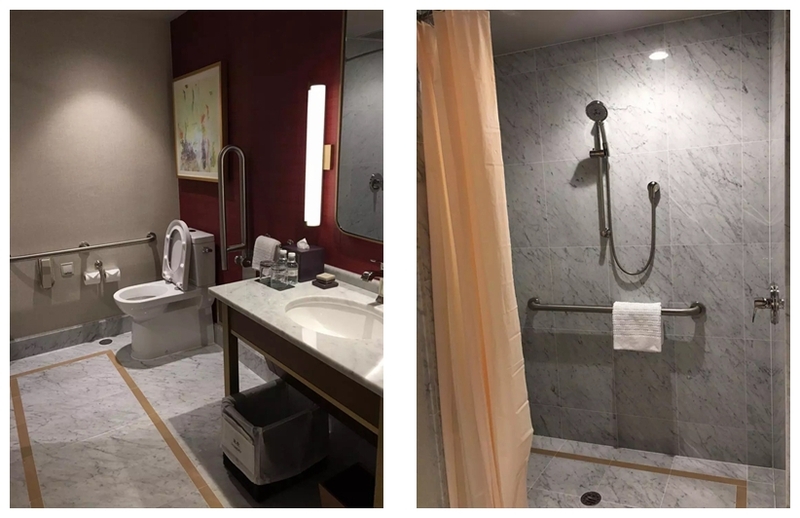 For a long time, I have eagerly awaited the chance to visit this new resort, and in October, barely a month after its grand opening, I finally had the chance. 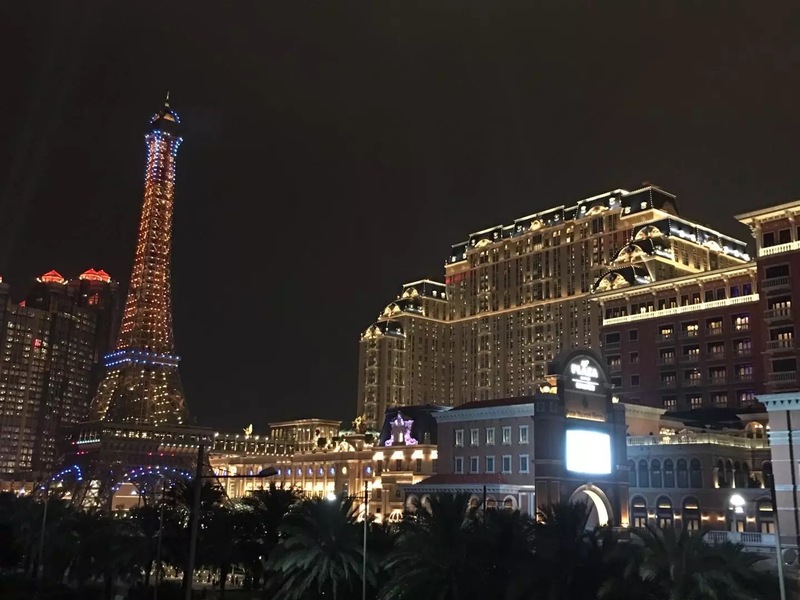 The Parisian is located in the middle of the Cotai strip, surrounded by other Sands Resorts hotels. 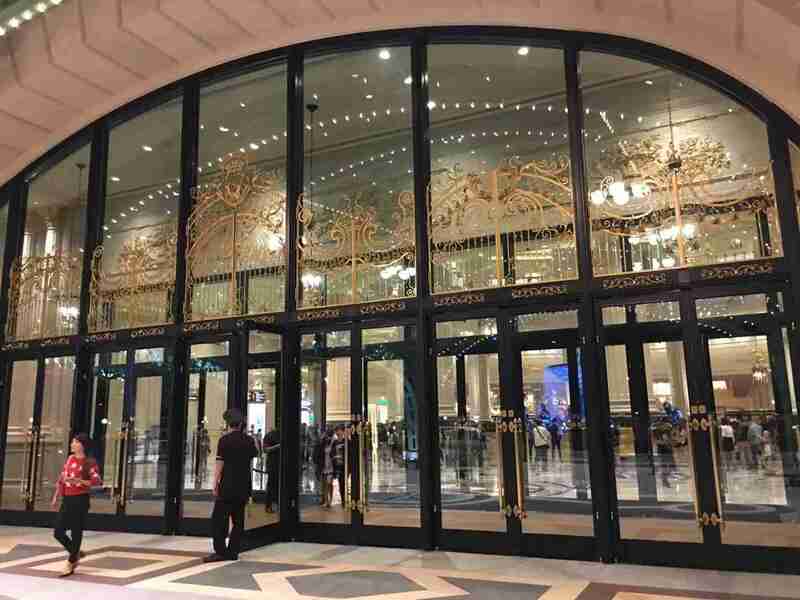 Next to it is the Venetian Macao and Four Seasons, and directly across the street is the Holiday Inn, Conrad, Sheraton, and St. Regis. The strip contains a plethora of shopping malls, including the Shoppes at Venetian, Shoppes at Parisian, Shoppes at Four Seasons, etc. These are all easily accessible by enclosed walkways connecting all of the nearby resorts. 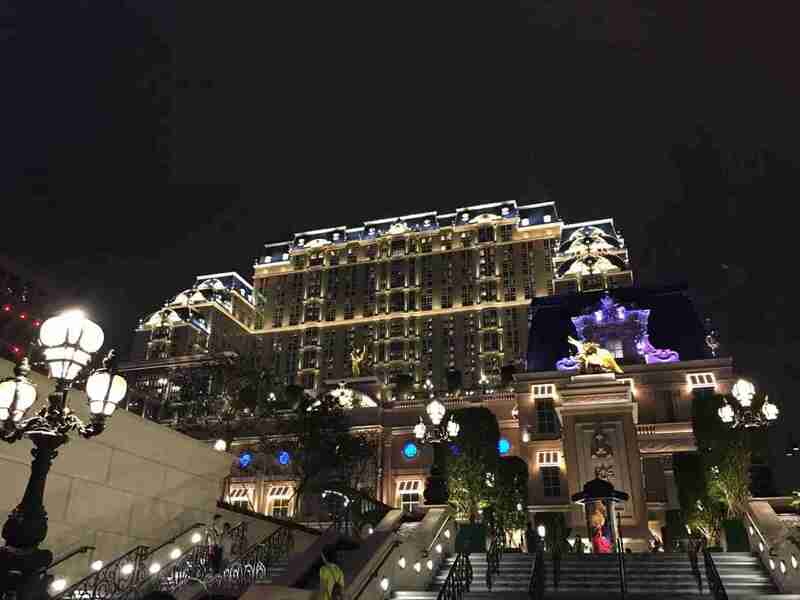 Needless to say, it is a great location to stay at in Macau. The easiest way to travel from the airport or ferry terminal to the hotel is via the bright pink Parisian shuttle buses (it’s hard to resist their charm). In the past, I had heard that children were not allowed on these buses, but I saw several people bring their children on. Because it was a new bus, the interior was very clean. Its onboard WiFi was easy to use. Hailing a taxi from the taxi stand in the hotel was simple and easy. 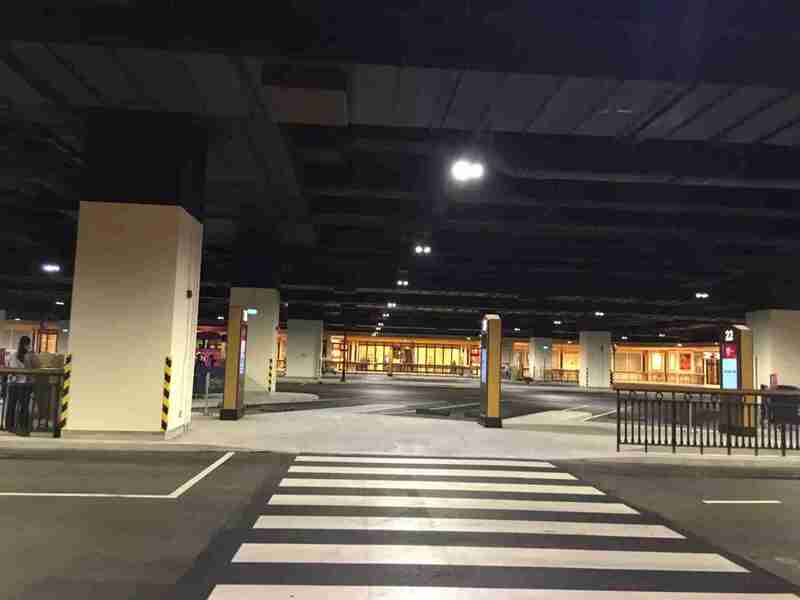 A ride to the airport costs around MOP30, and a ride to the historical district of Macau costs MOP60-70. 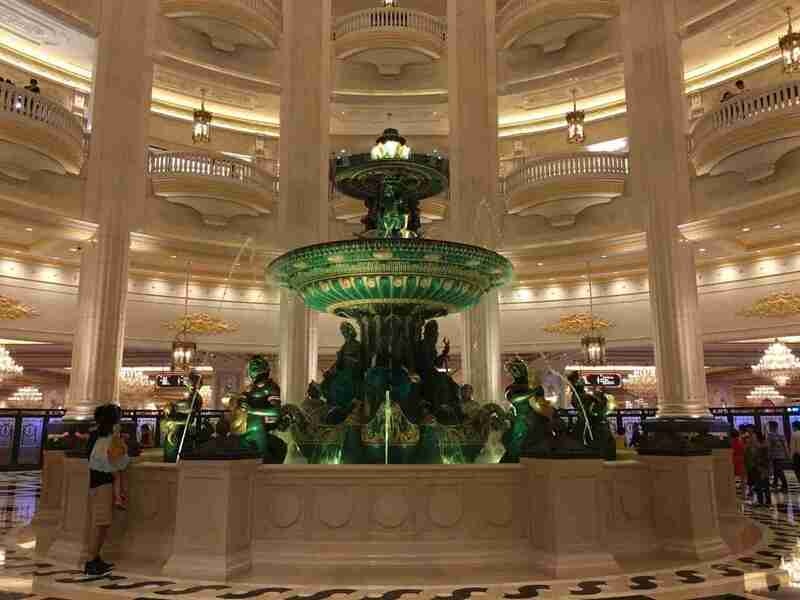 The exterior of the hotel is simply breathtaking! From a distance, you may mistake it for an exotic royal palace. 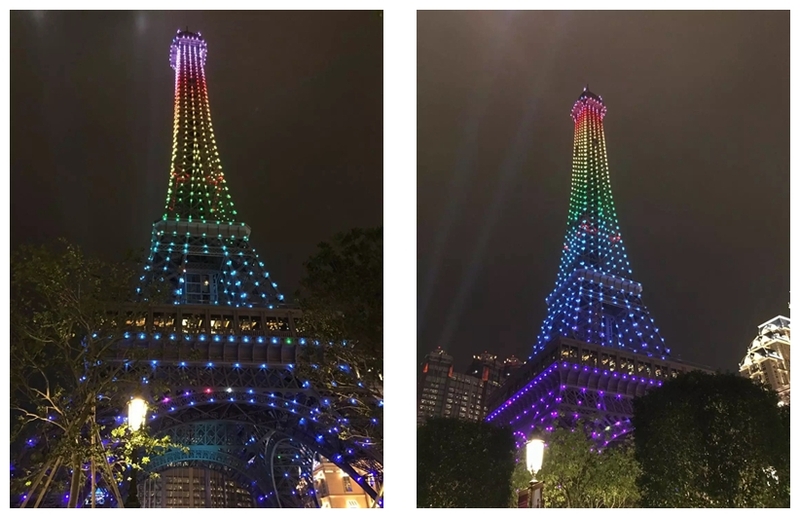 Next up is Macau’s latest landmark – the ½ scale replica Eiffel Tower in front of the Parisian. At night, it is lit up with a brilliant light show. This is the main entrance to the hotel. Its design is both grand and elegant. On the top of the picture you can spot the bridge connecting the hotel to the Eiffel Tower. You need to buy a ticket to go to the tower, but there are often special hotel packages and deals that include free entrance. The reception desk and concierge were located past these doors. 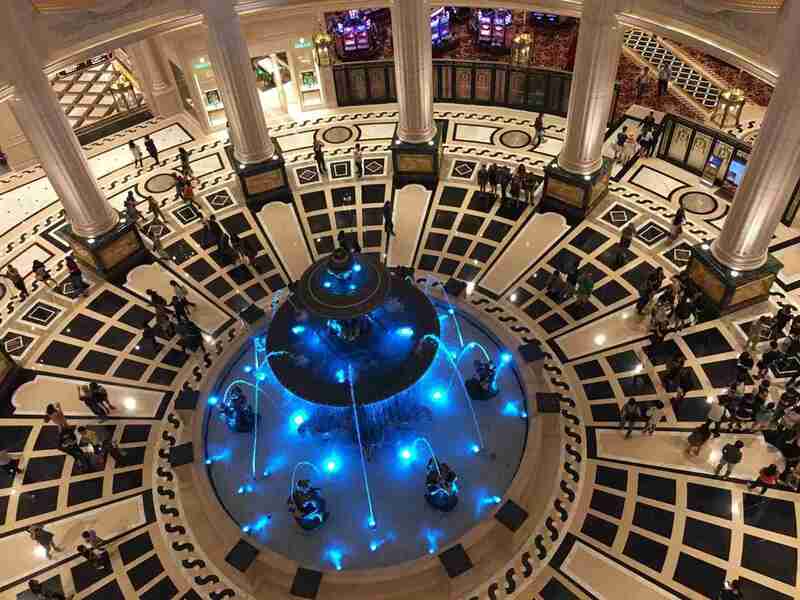 The lobby area is enormous, and features a large, brightly-lit fountain. I found its overall atmosphere to be almost romantic. Like the Eiffel Tower, the fountains colors change together with music. I saw many people taking pictures of it. The Parisian also features French-style street performers who sing and dance throughout the resort. They are also willing to pose for fun photos! After finally making my way to the hotel reception area, I had to wait in line to check in. 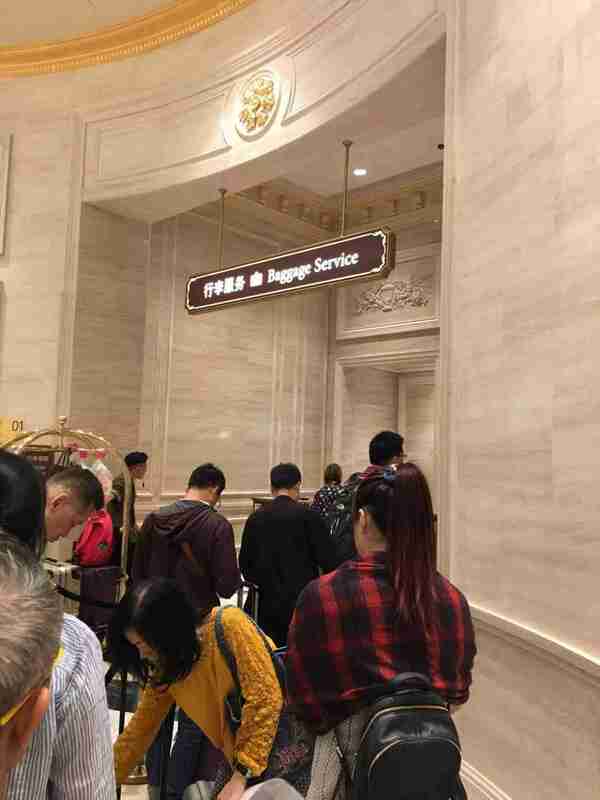 Because the hotel had recently opened, there were many visitors in line. Fortunately, this was managed well by the staff, and the whole process went smoothly. Like many hotels in Macau, there is a desk where you can store luggage. Whether you’ve arrived before your check-in time, or have just checked out, you can store your bags here for free. 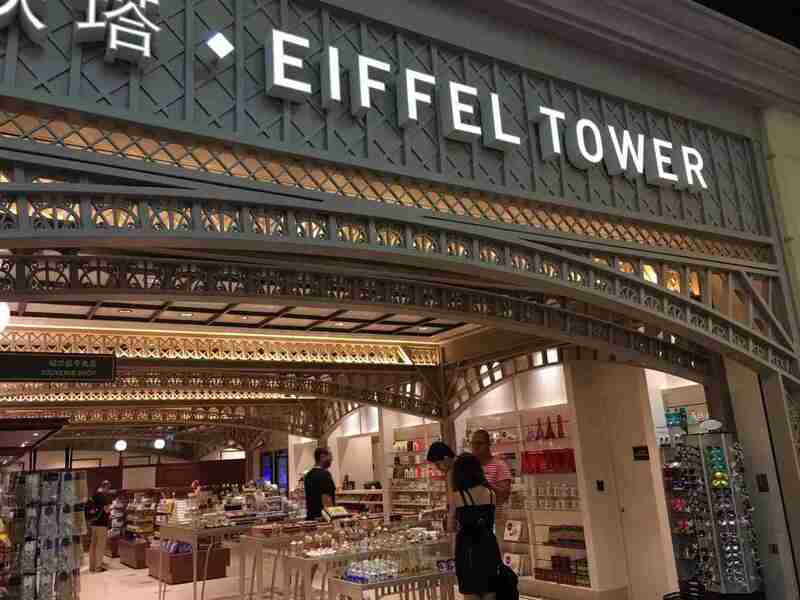 Even visitors who are not staying the Parisian can store their luggage here, for only MOP10 per item. 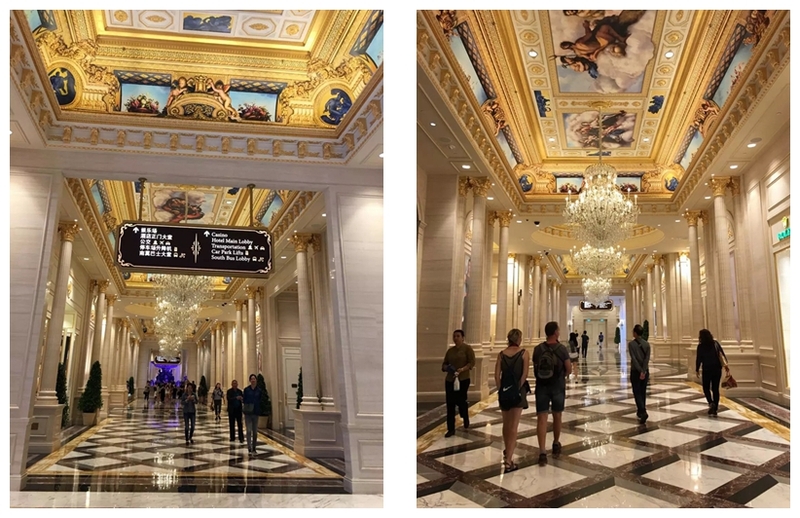 The hotel is quite large, and so paying attention to the large direction signs is a must. The interior halls were full of French-style decorations. The first floor hall ceilings were covered with classical European paintings. 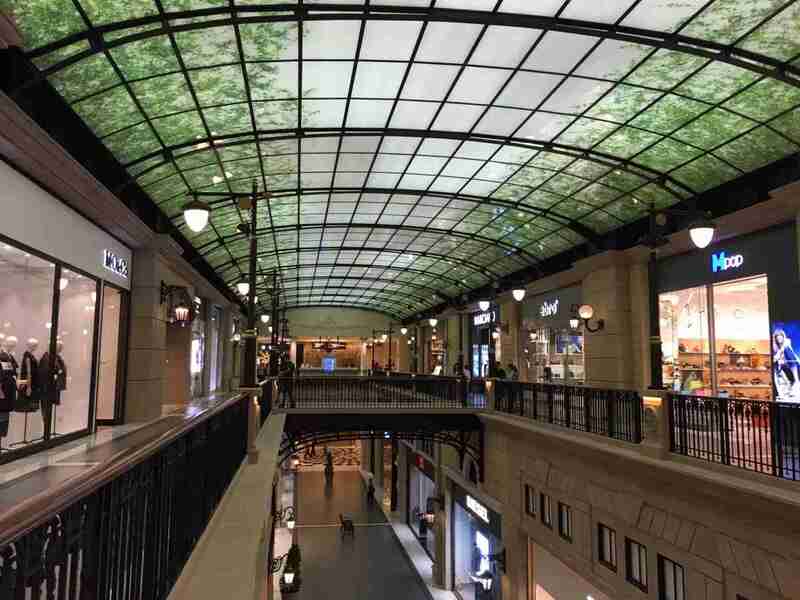 It seemed familiar to me for some reason: as if I had seen them before in Shanghai’s Global Port shopping center. Since the hotel had recently opened, it seemed like there was still a hint of construction smell in the air. There were several elevators leading to the upper floors in each lobby, and I never felt like I needed to wait long for one. 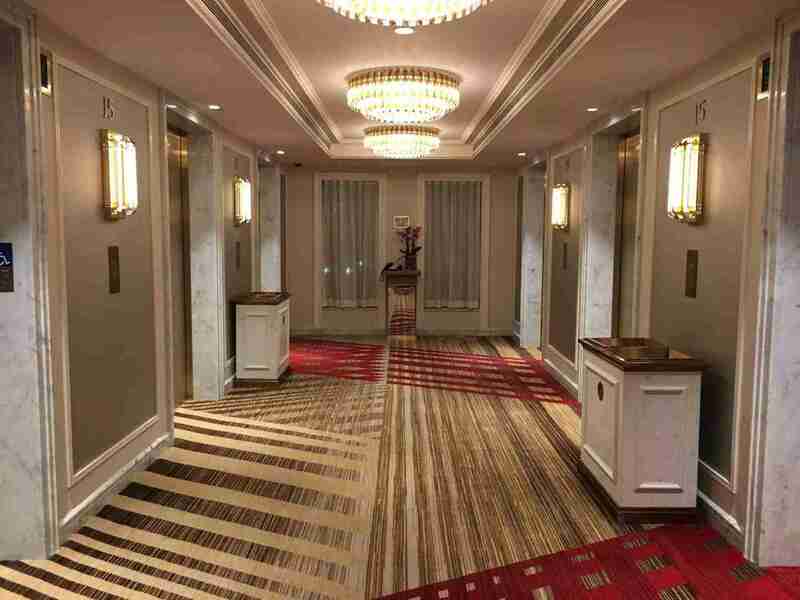 Like most hotels, you need to use a room key to access the room floors. 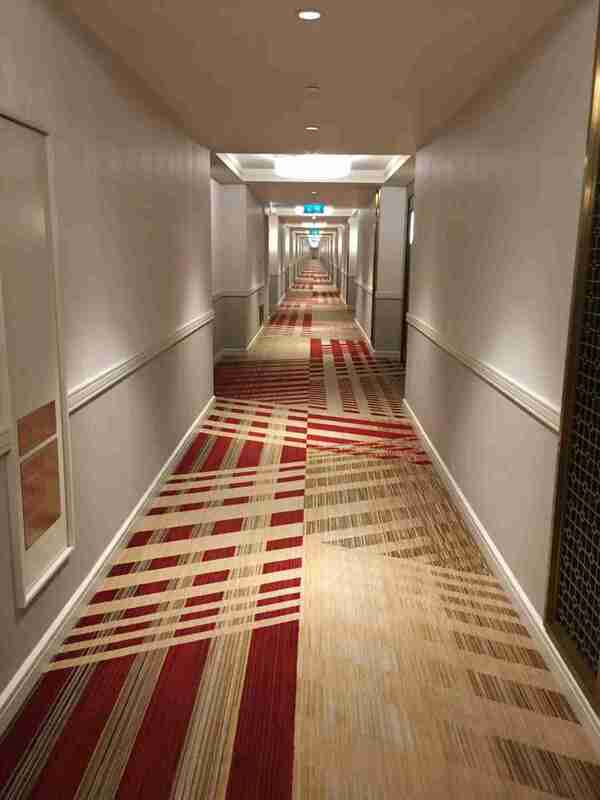 The hallways in the upper floors were plainer than I expected – in sharp contrast with the rest of the hotel. To be honest, I was a little surprised by how modest my room was. 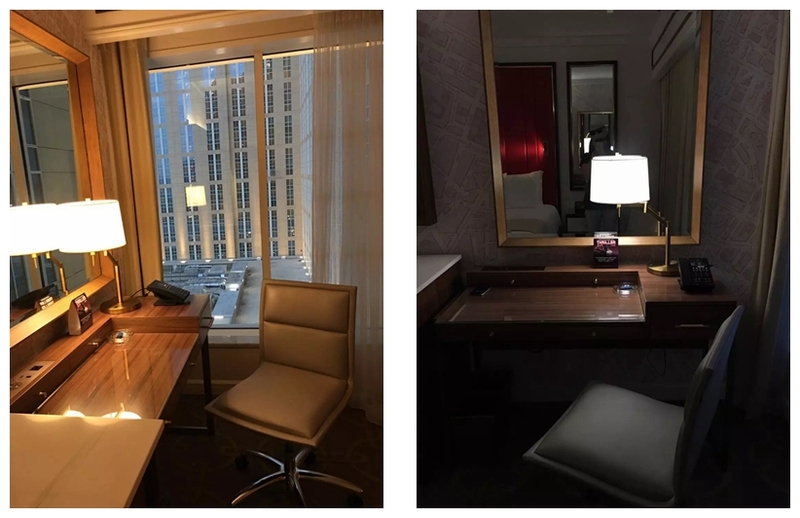 Having previously stayed at the Venetian, I had expected the Parisian’s rooms to be larger. My room had one king-size bed with simple bedding. The room decorations were all Paris-themed, and added some character to the room. The main colors of the room were white and red. The wallpaper was simple, yet elegant. The curtains were beige, and had no special ornamentation. Here is a picture of the view outside my window. The desk next to the window was also very plain. There were multiple types of power sockets available. The TV was quite large, and was mounted on the wall to save space. The bathroom was reasonably sized, and was as red and white as the rest of the room. That said, its design looked quite elegant. The shower was large enough, but the curtain did a poor job of keeping water from leaking onto the floor. Here is a view from the inside of the bathroom. The sink design was very simple. 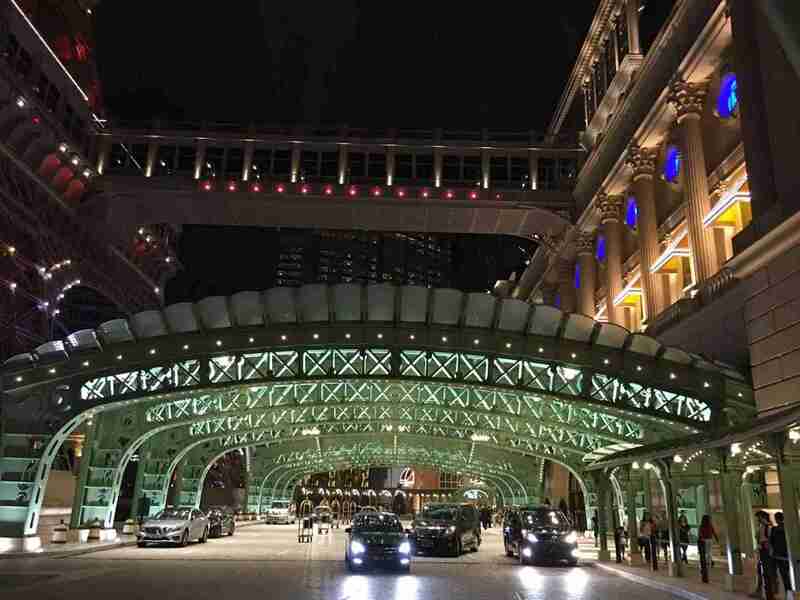 The Cotai strip is really spectacular at night. Here was the view from my window. Le Buffet, the buffet restaurant in the Parisian, was located on the first floor of the hotel. My room didn’t include breakfast, so I passed by it and didn’t go in. 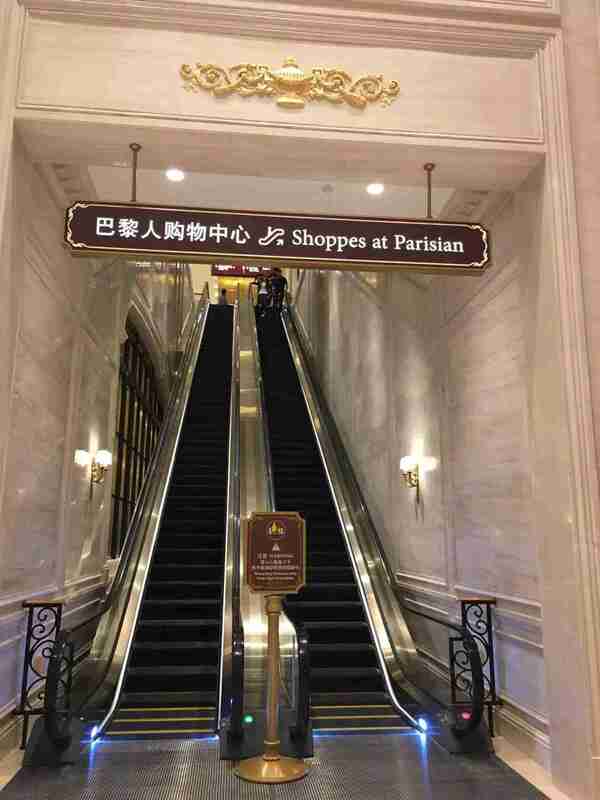 The resort includes a shopping mall called Shoppes at Parisian (obvious from this large sign). 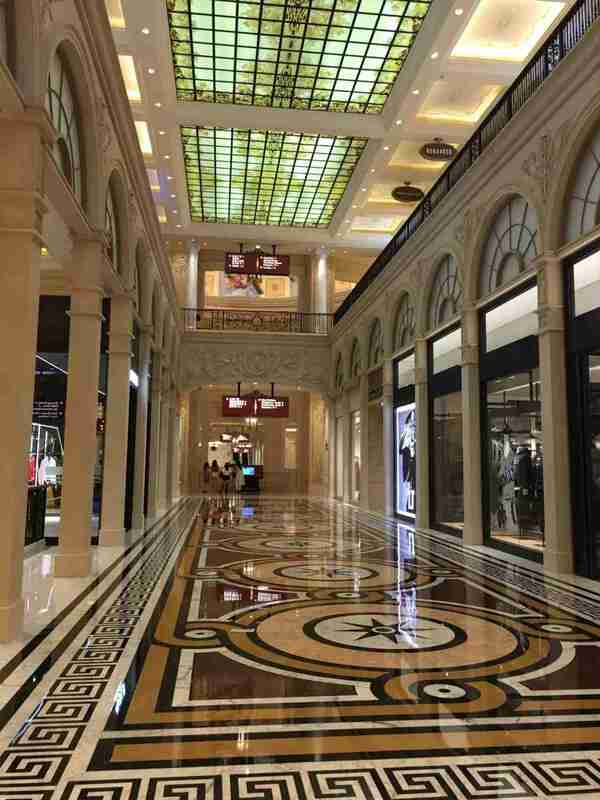 There were numerous fashionable shops to peruse, and I almost got lost walking around. This is one section of the mall. 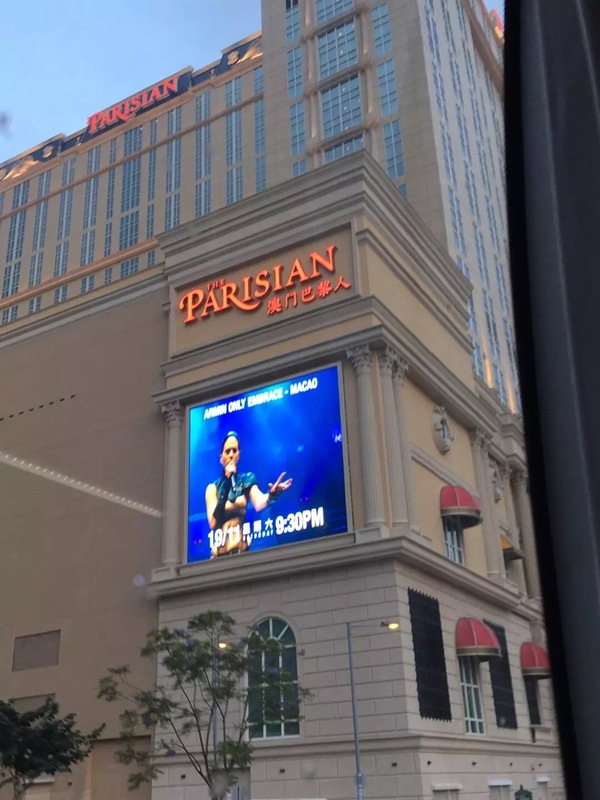 And of course, The Parisian has its own casino. This is the entrance to the Eiffel Tower. It sells many Paris-themed souvenirs. Sands Resorts contain countless different restaurants. 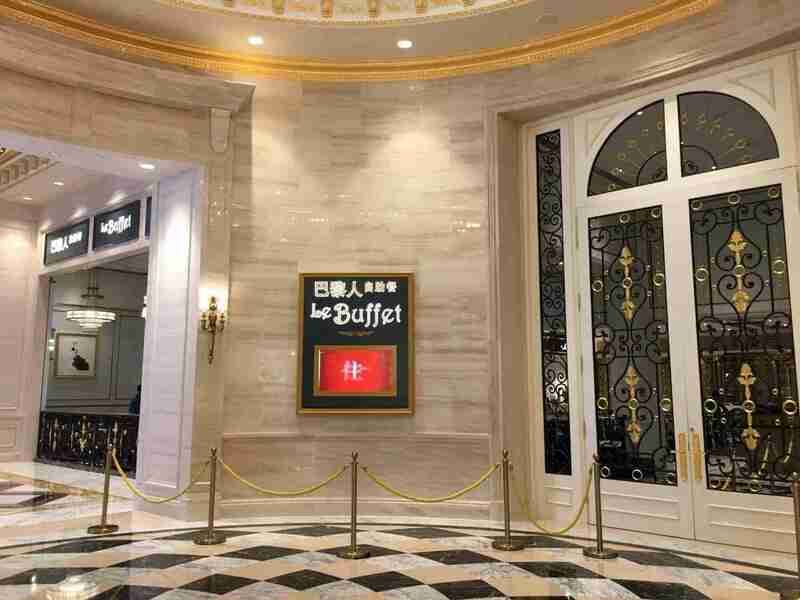 For this visit, I chose to eat at Grand Orbit, a buffet restaurant in Sands Cotai Central. The food was delicious, though the price was slightly expensive. I highly recommend it! 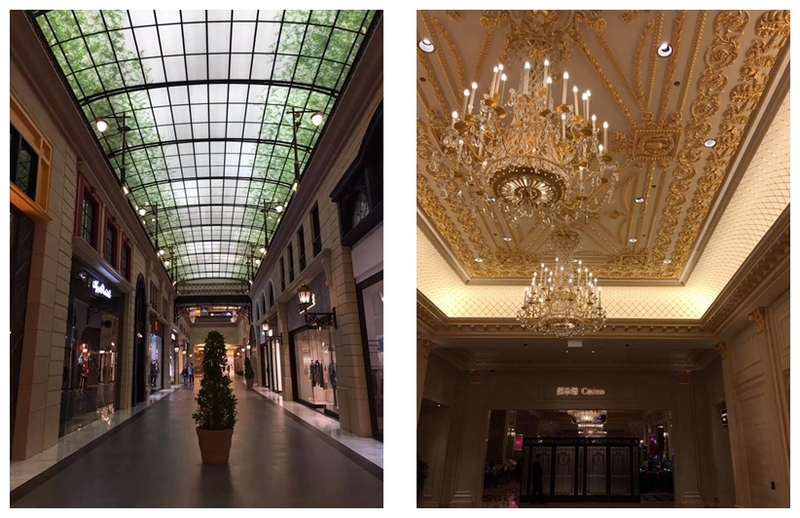 Even though the Parisian is a new hotel, I found the service to be quite good. The front desk staff was fast and efficient, which helped check-in lines move along quickly and smoothly. All of the staff that I interacted with were very polite and helpful. I was able to control the temperature of my room, and keep it very comfortable. The WiFi was easy to use, and I could stay connected no matter where I was in the resort. 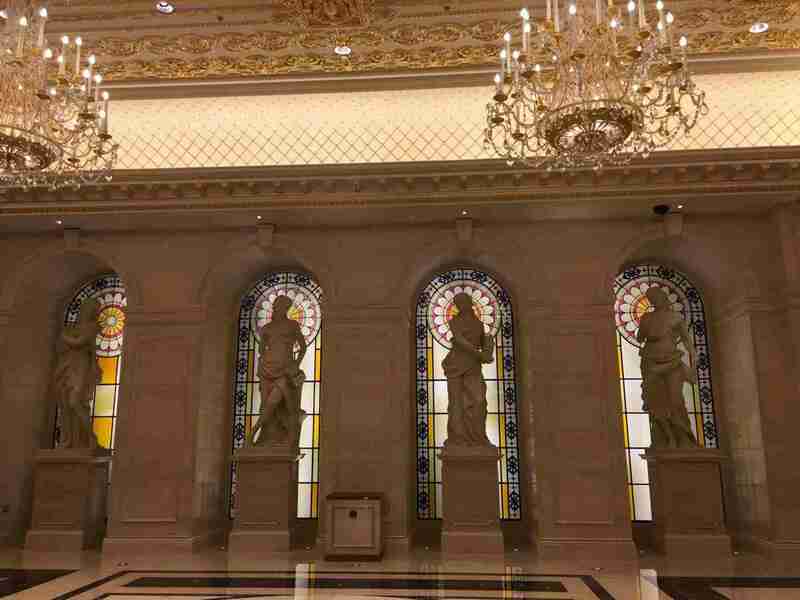 There is a theater in the hotel that features pop concerts, Broadway musicals and Las Vegas-style performances. There is also a hotel package offer that includes show tickets along with a hotel room. Because I visited during a weekend, my room was a bit more expensive than usual. If I used the price I paid to judge the hotel room, then I’ll have to admit that I was a little underwhelmed. It was only a little cheaper than staying at the Venetian, but the quality of the room was much lower. Despite this, I still really enjoyed my visit to this resort. 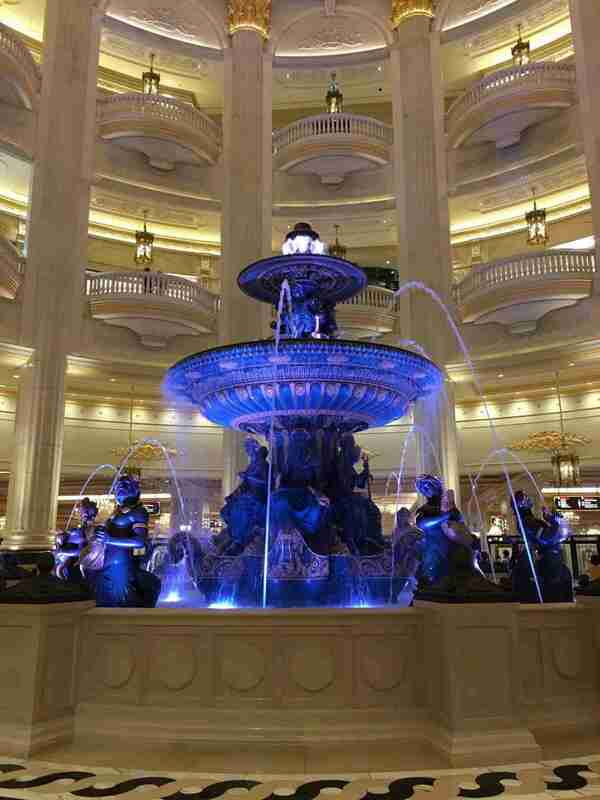 Next time I travel to Macau, I will definitely come back for a visit, though I will probably stay at a different hotel. Despite some of the negatives that I have mentioned, I really did get swept away with the theming and overall feeling of the Parisian. 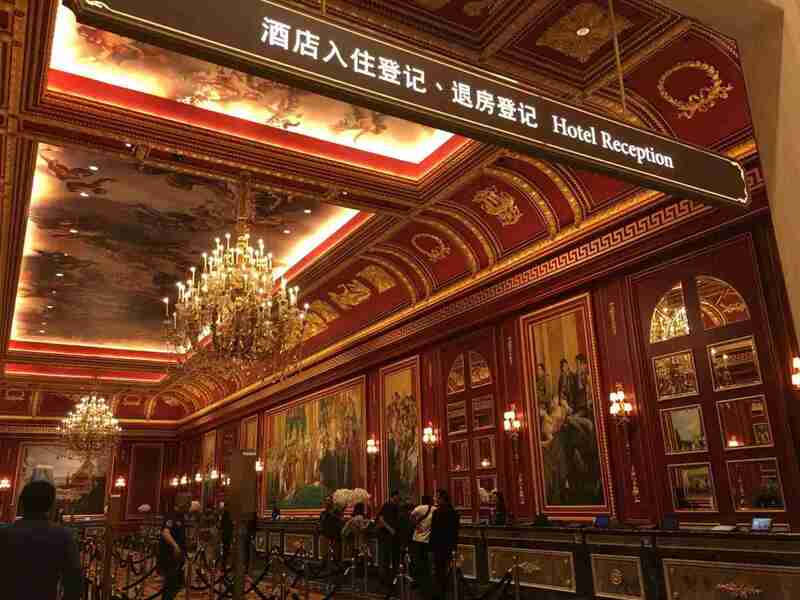 When I visited, there were posters of the famed French actress Sophie Marceau hanging up in every corner of the resort, featuring the slogan “Become Part of Paris at the Parisian Macao”. After staying here for a night, I completely agree.